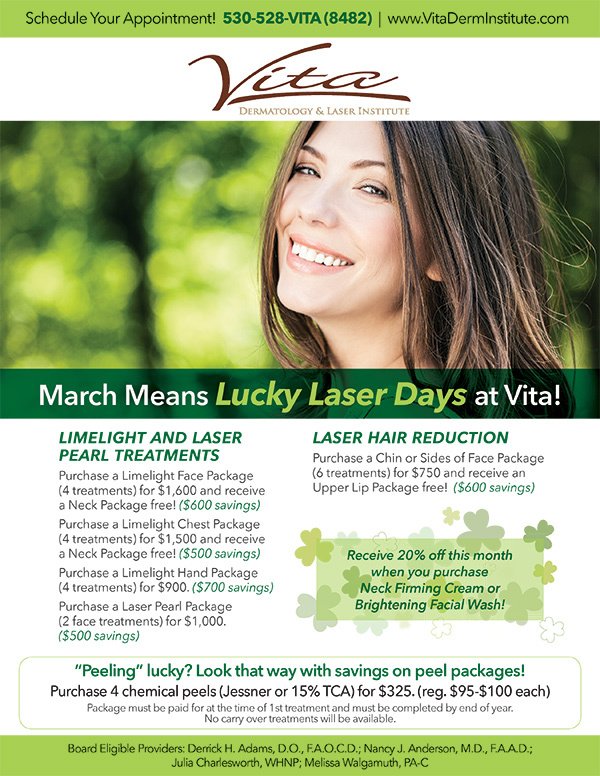 March Means Lucky Laser Days at Vita! This Special Ended March 31st, 2017. Package must be paid for at the time of 1st treatment and must be completed by end of year. No carry over treatments will be available. Receive 20% off this month when you purchase Neck Firming Cream or Brightening Facial Wash! Limelight is a treatment that can remove superficial sun damage, and visibly even out the skin tone in just one week, and with no downtime. Laser Pearl triggers the production of collagen and elastin to give you fresher, newer, younger looking skin. The Jessner Peel can trigger healing of acne, dislodge blackheads, reduce scarring, and improve the overall appearance of acne prone skin.